OPI Suzi and the 7 Dusseldorfs Swatch and Gelcolor Comparison! - Polish Etc. Today I have a swatch from from last autumn's Germany Collection to show you! The Germany Collection may have been one of my favorites from this year, if just for the gorgeous shimmers like Suzi and the 7 Dusseldorfs. I absolutely detest the name of this polish because I can never remember exactly what it is or how to spell it, but I love the color and finish. Suzi and the Seven Dusseldorfs is a red-toned purple with lots of really fine shimmer. The shimmer has little red and blue specks, and is much more interesting than it appears here. The shimmer is also very fine giving it a pearly-metallic finish just like Unfor-Gretta-bly Blue (another of my favorites from the Germany Collection). I just love this polish, it's gorgeous and so much prettier in person than it looks in photos. Here's a shot with the mis-matched outfit I wore that day. I know that purple and green don't particularly match but I love how they look together. Now for an interesting comparison! I recently started getting into gel nail polish. It lasts a long time and helps protect my nails from rough treatment at work (my nails have been particularly fragile lately, which is why they are super short right now and most of the photos you've been seeing are from several weeks ago). The following photographs are taken with the exact same camera/lighting/settings. Here's the interesting thing... Suzi and the 7 Dusseldorfs in Gelcolor is a totally different polish! Yes, it's similar, but definitely not the same. 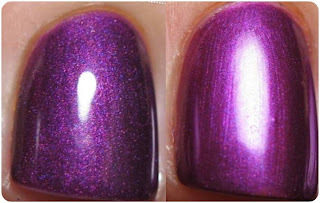 In Gelcolor this polish is a beautiful purple jelly base with pink and blue shimmer. It's a darker color, with less red-tone than the regular polish, and the finish is completely different. This color is absolutely stunning in it's own right, I think it deserved it's own name. Here it is with the shirt I wore last time so you can see that the polish is a different color, not the lighting or anything. Here they are side by side. Both gorgeous, but the same polish? Not quite! Has anyone else tried OPI Gelcolor? Do you find that the colors are similar but not the same? I know this really surprised me and I'd love to know what you think! Wow, what a difference!! I don't use gel so I wouldn't know how others compare, but I think I prefer the gel one in this instance! !